Dubbed a “four-day creative festival for all things weird, fun, and free,” SPARKCon has something for you no matter your creative outlet of choice. 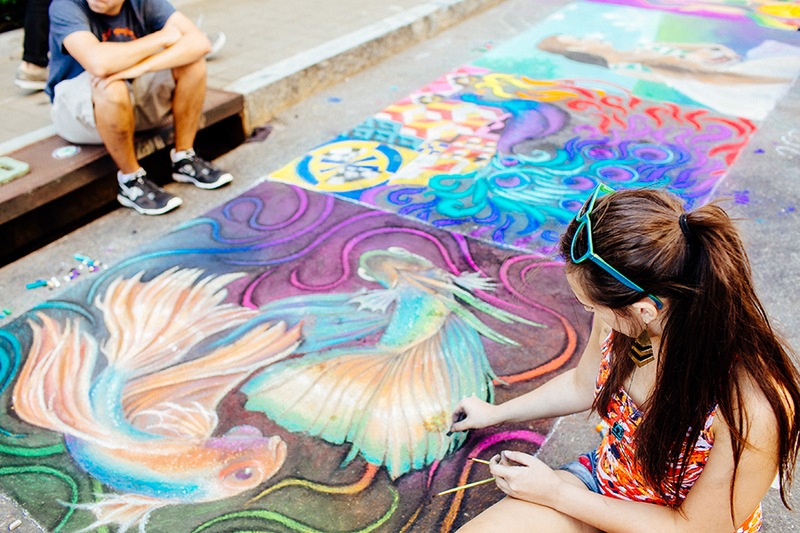 Watch as Fayetteville Street is covered with bright chalk drawings, or catch a fire dance, a fashion show, or a film festival. Sample creative cuisine, attend a writing workshop, or take a salsa class. Learn about architecture, city planning and urban design, or enter a competition to build creative homes for dogs and cats. With more than 2,000 artists and 200 different events, the options for engagement, entertainment, and education are endless. Just head downtown. SPARKCon happens September 14th-17th. Learn more at sparkcon.com. Chandeliers that appear to hang from the sky. Tables that run the length of Fayetteville Street. A meal from award-winning, Kinston-based chef Vivian Howard, with assistance from Raleigh’s Dean Ogan of Rocky Top Hospitality and Jason Smith of 18 Seaboard. In the first magical event of its kind, the North Carolina Symphony is hosting a black-tie gala in downtown’s City Plaza. Guests and symphony supporters are invited to enjoy cocktails, a farm-to-table dinner of Southern cuisine prepared by Howard, and a late-night dessert reception. The event supports the North Carolina Symphony, which brings classical music performances and music education to the entire state. Catch this one-of-a-kind event on October 7th, and find out more at ncsymphony.org. There’s likely no lovelier backdrop in Raleigh for a day of live music and an outdoor festival than the stone amphitheater next to the city’s downtown rose garden. For its third year, Groove in the Garden has moved from August to October, and has lined up acts such as American Aquarium, Asheville’s Toubab Krewe, and Raleigh’s own bluegrass ensemble Hank, Pattie & The Current. There will be food trucks, beer and wine, artists, makers and other vendors, and kid-friendly activities. And, of course, there will be the more than sixty varieties of roses that, for this year at least, won’t be in bloom for very much longer – so enjoy them while you can. Groove in the Garden happens October 21st at 301 Pogue Street; tickets are available in advance at grooveinthegarden.com. Last year, more than 100,000 people from all over the world visited North Carolina’s State Capitol in downtown Raleigh. They took their children to the Capitol’s history programs, enjoyed concerts, lectures, and docent tours, or just marveled at one of the best-preserved examples of Greek Revival architecture in the US. All of the Capitol’s programs are free and open to the public, and the State Capitol Foundation ensures the ongoing restoration of the 177-year-old building. They couldn’t do all this without fundraising events such as the annual oyster roast, where the public is invited to come eat oysters and shrimp, drink beer and wine, and enjoy live music from The Embers. Bring your appetite; the Oyster Roast happens October 6th from 7-11pm on the Capitol grounds, and all proceeds benefit Capitol education and preservation programs. It started out as a neighborhood parade at Pullen Park Terrace, on Kirby Street, in 2002. This August, Kirby Derby marked its “Not So Sweet” themed, 16th anniversary at nearby Dix Park’s Harvey Hill to accommodate the racers, spectators, and fans whose ranks have outgrown the event’s humble Kirby Street namesake. Kirby Derby’s most exciting feature? The annual, highly competitive soapbox derby. To enter, drivers build their own gravity-powered racers (no motors! no pedals!) and vie to travel downhill, around curves and bends, the fastest. Volunteers work for six months to organize the free event, which also includes a kids pinebox car competition, a drag race, and a parade. Kirby Derby is, in essence, a celebration of creative expression and community building – souped-up soapboxes, silly costumes, and city spirit are staples. It’s been decades since David Sedaris said goodbye to his extended bohemian youth in Raleigh and set off for Chicago, then New York, then evenutally to international renown. Now, after years of savoring his wit in issues of The New Yorker and his frequent live tours, it’s something of a shock to realize that the one-time Santaland elf celebrated his 60th birthday last year. Sedaris himself seems to be in a backward-looking mood: Earlier this year, he published selections from his diaries written between 1977 and 2002. From the early formative impressions as a young man in Raleigh, Chapel Hill, and out on the highways of America, to his rise to celebrity in the early 1990s and the disillusionments, the pressures that followed, Sedaris’ private writing is compulsively fascinating. On October 23rd, he holds forth at Raleigh Memorial Auditorium. dukeenergycenterraleigh.com. If you read the sports business pages, you may know that times are bad for NASCAR. Once America’s hottest emerging sport (hey, even Will Ferrell made a movie about it), its prospects have soured in recent years as crowds have dwindled and sponsors have fled. The reasons for NASCAR’s retreat are complex, but one consistent refrain is that the sport strayed too far from its Southern roots, specifically the North Carolina moonshiners who formed the core of the sport’s origin myth . Stock car racing may be a dying sport on television, but in Raleigh, you can check out the original, brewed-in-the-bathtub variety by going to Wake County Speedway. On September 15th, saddle up and head down Fayetteville Road toward Lake Wheeler for the final event of the season, with six races scheduled. wcspeedway.com/schedule/. The beauty of flat-track roller derby is that its practitioners have carved out a unique spectator sport that is both fiercely and skillfully competitive and, in a welcome departure from most sports, good-humored. The Carolina Rollergirls have been barreling around on their skates for more than a decade and show no sign of stopping. They will, however, pause for the season after the year’s final bout on October 28th, starting at 5pm at the Raleigh Convention Center. Can’t wait that long to rub elbows with these bruisers? Consider attending the October 11th fundraiser (the group is a 501(c)(3) non-profit) at Boxcar Bar + Arcade. carolinarollerderby.com. There’s no geek like A/V Geeks. Years ago, Skip Elsheimer discovered that he loved the instructional videos that he remembered viewing as a child. Somehow, it turned into an obsession, and he became one of America’s foremost curators of the often goofy genre of film that yields titles like What to Do on a Date, and Epileptic Seizure Patterns. What may seem to newcomers as a camp joke taken to extremes is, in fact, a serious, lifelong work of curation and scholarship. You can tell a lot about a culture by its instructional films. Join A/V Geeks at Kings on September 17th for a night of “Women Make Educational Movies.” Pick hit: The Fur Coat Club, by Joan Micklin Silver, who would later make such acclaimed films as Crossing Delancey and Hester Street.